GATE 2018 is approaching and its’ high time you gather awareness of the shortcuts and tricks for the General Aptitude section. General Aptitude section is undoubtedly the most scoring section of the GATE exam and learning some Effective Shortcuts and Tricks for this section could really help you to ace the General Aptitude section. In order to assist you in your preparation of General Aptitude section, we bring forth this article which will acquaint you with Effective Shortcuts & Tricks for General Aptitude section of GATE. Subscribe for free shortcuts and tricks , exam updates and tutorials at your personal email id. 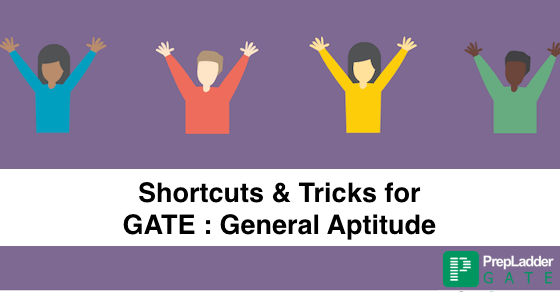 Here, we provide Topic-wise Shortcuts & Tricks for General Aptitude section of GATE 2018. These are one of the most scoring set of questions. For questions based on Line Graphs and Bar Graphs, you can rely on visual clues and eliminate a few options based on visual clues. This would help you to arrive at correct solutions without putting in much effort and at a faster pace. Prior to Commencing calculation, make sure to read and interpret each and every statement very cautiously and avoid spending time on unnecessary calculations. Also, ensure to copy numbers correctly onto the sheet while solving the questions. Must Read : What is GATE 2017 Guarantee Pack? What is the Benefit of Availing It? Trick 2: Do not get confused between Marked Price and Selling Price. Discount is generally given on the Marked Price. Therefore, in this case, Marked Price will be higher than the final Selling Price. You must Round off Decimal numbers to the nearest Whole numbers in order to obtain approximate value of the equation. The only difficulty which is being encountered in solving these questions is identifying the pattern.Practicing 40-50 questions on this topic would provide you awareness of 90% of the patterns. Learn Tables and Squares up to 20, Cubes up to 10 and fractions up to 1/20 in order to speed up your calculations in the exam. Work on Speed and Accuracy by attempting Online Mock Test Series. We are sure that the Valuable Tips listed above would surely help you to boost your score in General Aptitude section of GATE 2018.